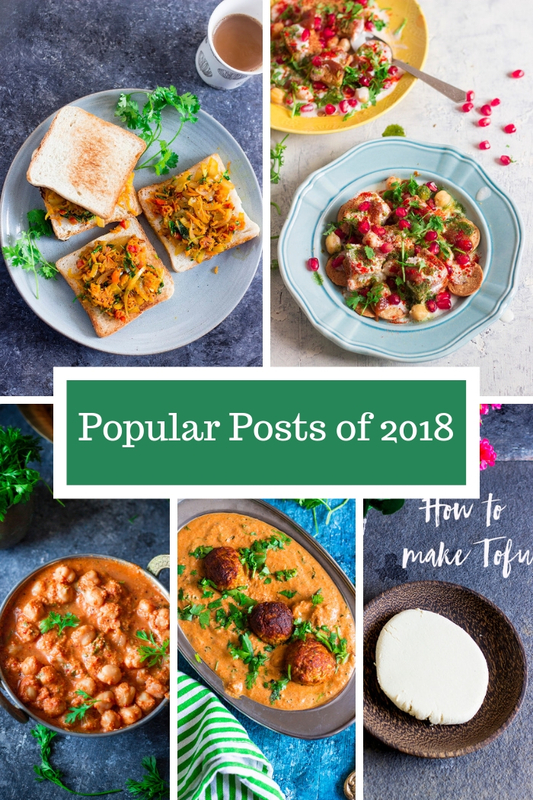 A compilation of top five most popular recipes of 2018 on One Teaspoon Of Life. Hi All, Happy New Year to you!! I hope you had the best holidays ever. Did you spend quality time with family? Did you party hard until you dropped? Whatever you did, I hope it was fun and it involved a lot of food. As we start a brand new year, I looked back on the progress I made on the blog over 2018. It was one of my best years, here on One Teaspoon Of Life. My reader base grew, my reach and impressions on social media grew so much, plus, I started my own YouTube Channel. It was a fun filled year here in the kitchens of One Teaspoon Of Life. 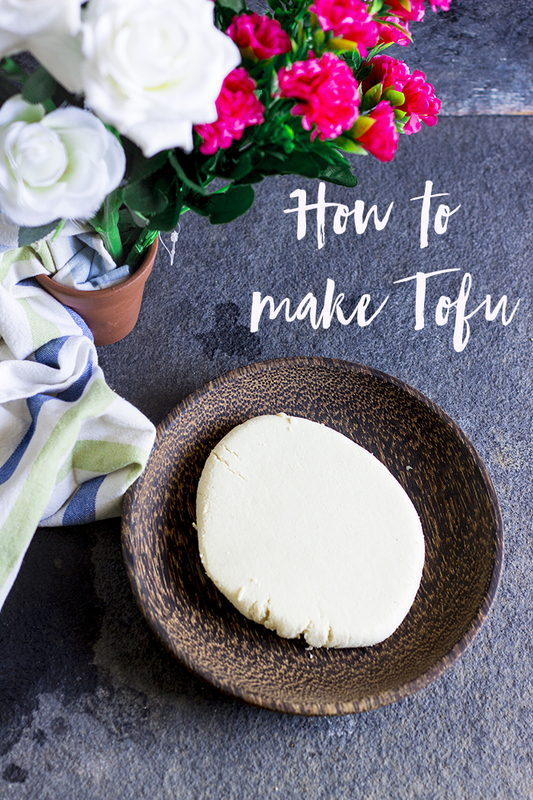 This post showed how to make tofu when you don't have access to nigari. It contained a video with step by step process on making tofu with lime juice and DIY tofu press. It also contains links to make your own Soy Milk. This recipe is a delicious take on an otherwise boring vegetable. The bottle gourd was mixed with chickpea flour and spices to make a kofta ball that was later simmered in a spicy tomato based masala. 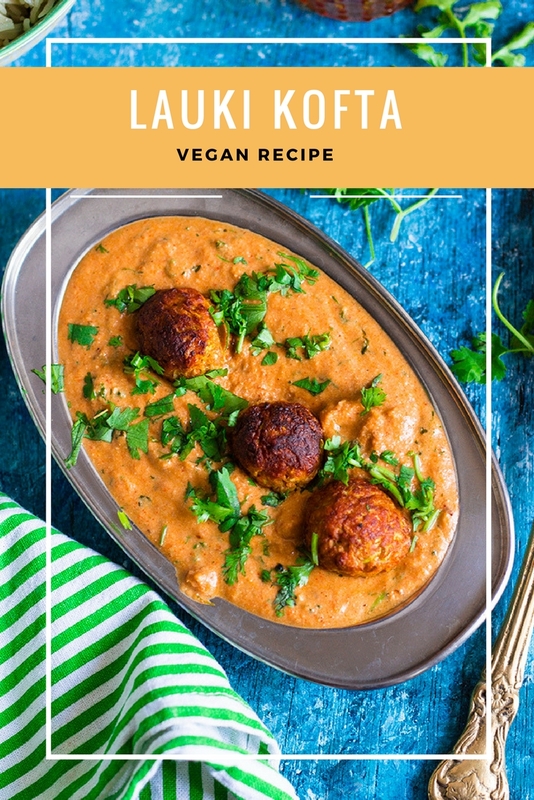 This recipe also included a video that gave you step by step instructions to make Lauki Kofta. How much this recipe was loved actually surprised me at the time. 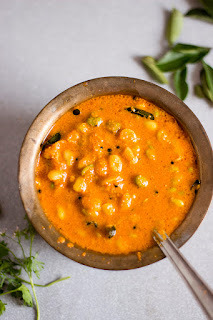 I've posted various recipes of chana masala or chhole on One Teaspoon Of Life, but this South Indian version was the most appreciated. Unlike the North Indian versions, here the chickpeas are simmered in a masala made with fresh coconut and spices. No video here, but some really good photos. You guys loved this simple local bakery style dish. I love it to. 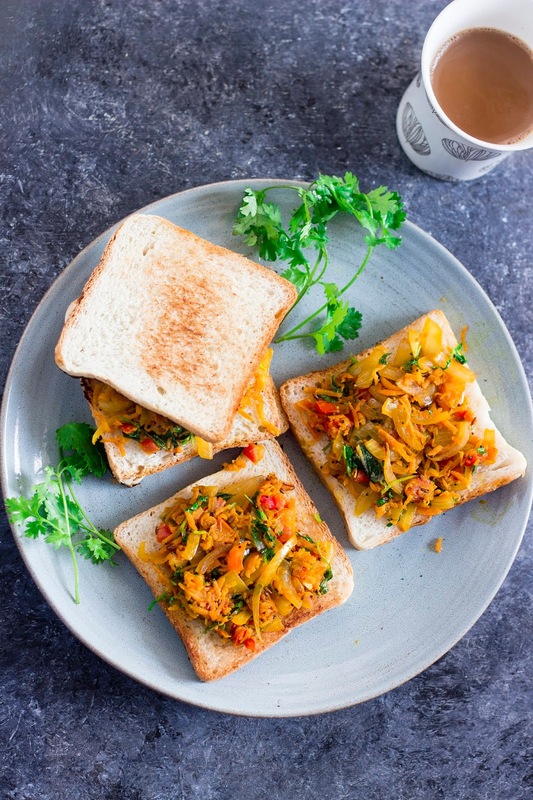 Masala Bread Toast is a simple dish in which spicy sauteed onions are topped on a piece of toasted bread. This post included a video that provided step by step instructions. I loved this one sooo much. 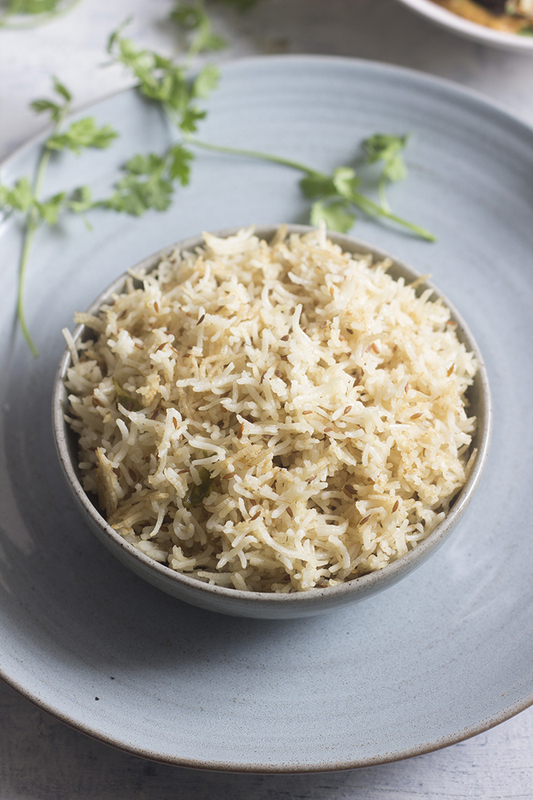 It is such a simple and flavorful dish. 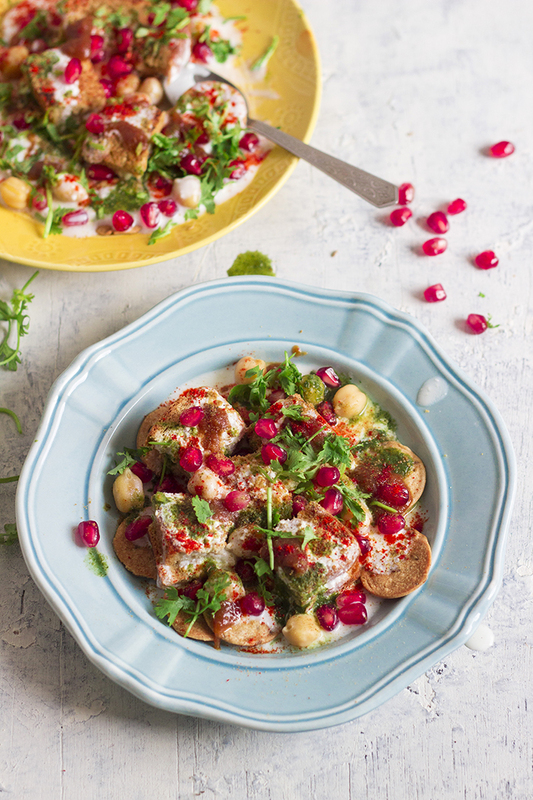 Toasted bread topped with whisked yogurt and sweet and spicy chutneys, colorful pomegranate, chickpeas, onions, tomatoes and what not. It was my quick take on a more complicated Dahi Bhalla and it was loved my all of you. This recipe contained step by step photo instructions on how to assemble this plate of beauty. You guys loved this compilation too, a little more than few of the recipe posts. Hope you have a snackalicious 2019. 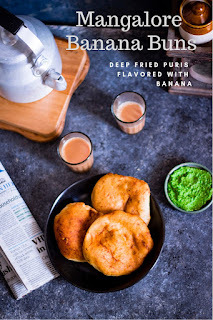 Mangalore Buns or Banana Buns are deep fried slightly sweet puris flavored with ripe bananas. 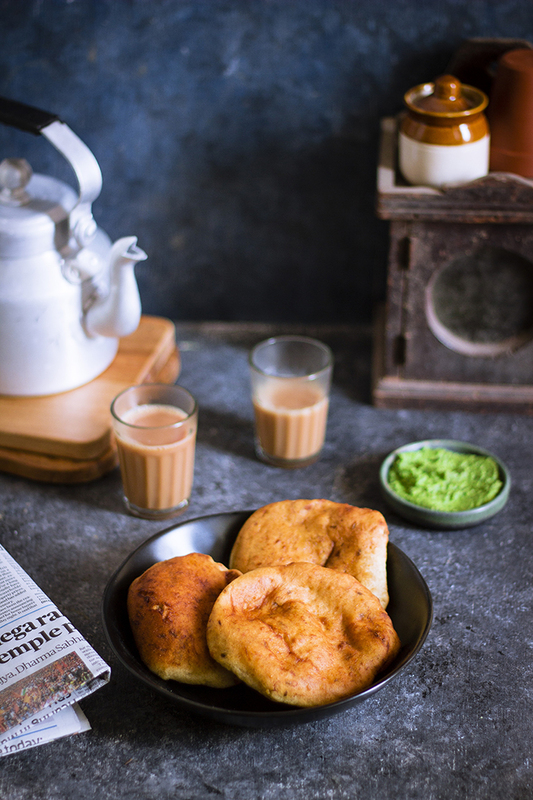 These Mangalore buns are vegan and are popularly enjoyed as breakfast or tea time snacks. Hi Peeps, how are you doing? All set for the holiday season? Plans made with family? Holidays with family are the best, aren't they? You create so many memories that you can feel nostalgic about in the future. Most of my favorite memories are of vacations with my family. This dish of Mangalore Buns features prominently in one of my childhood vacation memories. Early in the 90's Indian Railways started changing all meter gauge trains to broad gauge and that meant that trains were no longer accessible to the general public. Until then, we always traveled by train to my grandma's house, a tiny village near the city of Mangalore. Then started the days of bus travel. Since the village was so tiny, there was no direct bus from Goa. We had to alight at the closest point and wait for a connecting bus, all at 5am in the morning. While waking up that early was a torture, there was a silver or rather golden lining there. Before the first connecting bus arrived, a small restaurant would open its doors and start selling breakfast and these golden Mangalore Buns were always on the menu. My mom introduced us to these buns, and what an introduction it was. My love affair with these Mangalore Buns started back then! Till today, when we are around Mangalore, we go in search of tiny restaurants that make fresh buns. If you want to know some of my favorite places, ask me in comments. What is not to love? The buns are banana flavored and deep fried. They are more like Banana Puris. Mildly sweet with specks of cumin all over, they are just super delicious. Mangalore Buns are one of the only sweet breakfast that I enjoy, otherwise, I'm a savory breakfast girl. 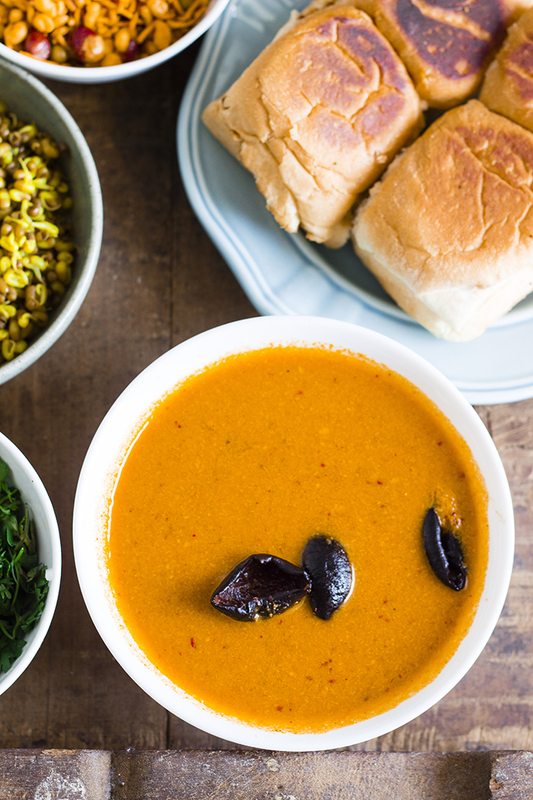 Mangalore Buns are commonly served with a simple coconut chutney and a piping hot sambar. Traditionally, all purpose flour or maida is used to make the Mangalore Buns. But I usually use 50% all purpose flour and 50% wholewheat flour (atta). I've made it also with 100% wholewheat flour and it did not absolutely take away from the flavor, the texture however wasn't as spongy and the bins were slightly flat. I still did not mind that, they still tasted amazing. The dough can be rested overnight if the temperature is lower, else you can rest it in the fridge in warmer weather. These buns are a perfect way to use overripe bananas that you may have discarded otherwise. Ripe to overripe bananas work best in this recipe. Serve the buns with chutney or just plain. Go ahead, make them this holiday season, and create your own special memories. Fun fact - No matter whether it is just one bun or multiple, it is always called "buns". Mangalore buns are banana flavored deep fried buns made from either all purpose or whole wheat flour. 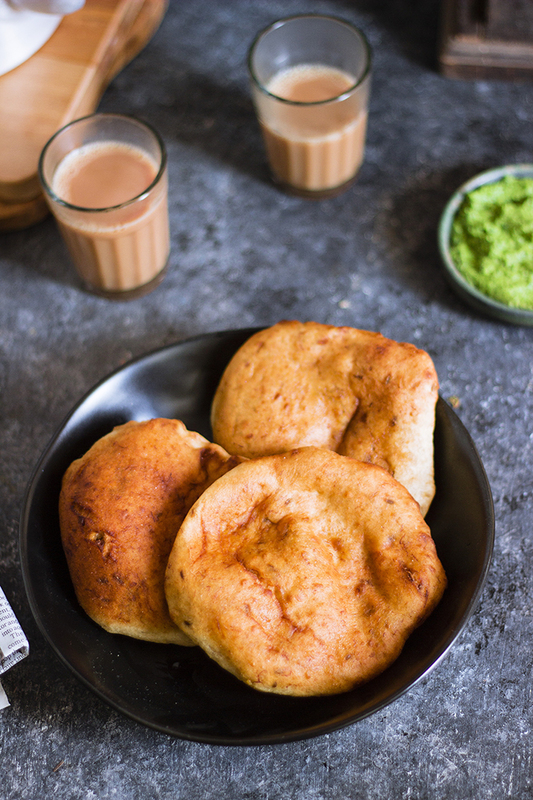 These vegan buns are a popular breakfast around the city of Mangalore. 1. Mash the bananas with powdered sugar until smooth. 2. Add in the cumin seeds, whisked curd, baking soda and salt. Mix well. 3. Add in the flour and knead into a stiff dough. 4. Apply a little oil on the dough to prevent it from drying. Cover and rest for 2-4 hours. The dough can be rested overnight too. If the weather is warm, rest in the fridge. 5. Dust the kitchen counter with some dry flour. 6. Pull out a ball of dough and roll it out on the dusted counter. 7. Heat oil for deep frying. 8. Carefully drop in the rolled out buns and fry on medium high heat until one side browns. 9. Flip over and fry until the other side browns. 10. Remove from oil and place it onto a absorbent kitchen towel to cool. 11. 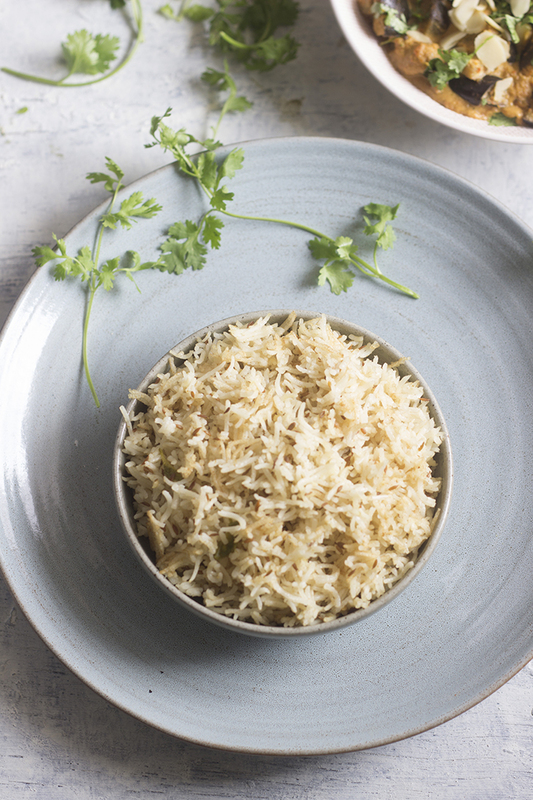 Serve hot or at room temperature with chutney. 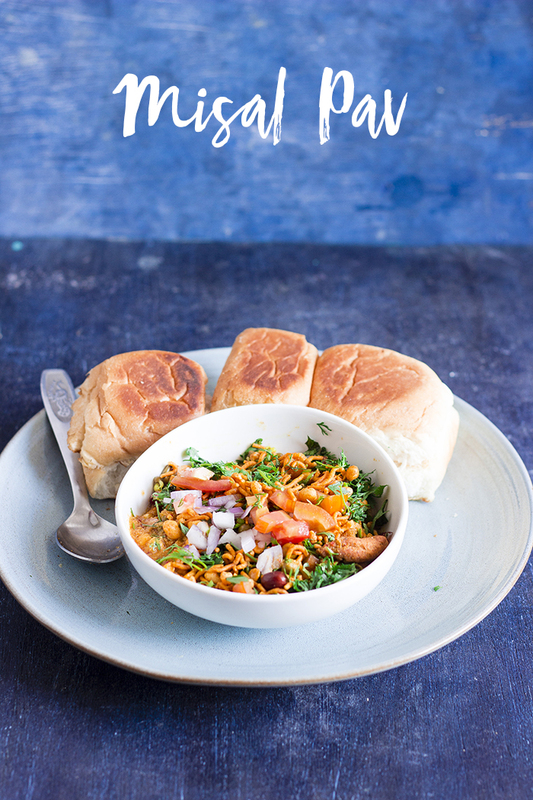 Misal Pav Recipe. This video shows how to make popular Maharashtrian spicy vegan curry called Misal. 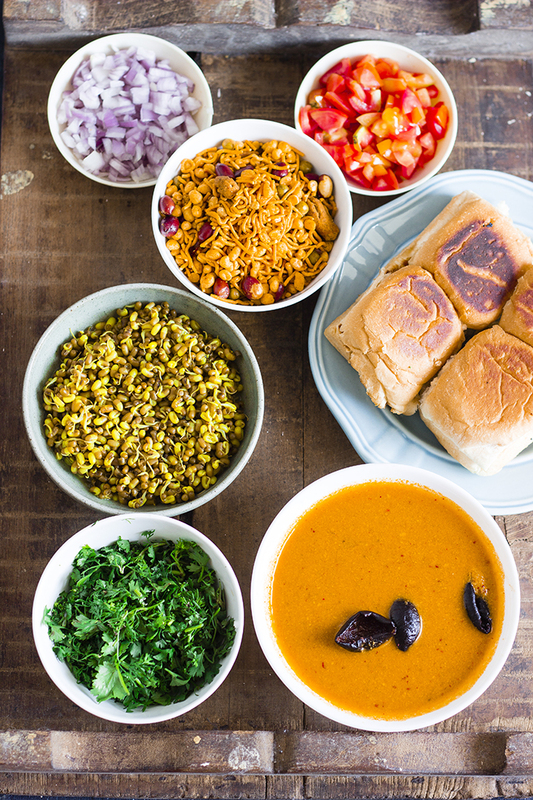 Misal is a curry made with sprouts and coconut that is topped with Sev or Mixture and served with Pav. Bangalore has the weirdest weather of all places I've been to. It can be bright and sunny one day and pouring cats and dogs the next. We ran through October like it was Summer, barely a hint of chill in the air and the Sun was all powered on. And then we got loads of rain, just when I was ready to get those light trousers and leather footwear out !! Finally, since mid-November, the chill has been setting in and it feels like Winter, at least in the evenings. The days are still as hot as Summer. When it's cold outside, I want to stay cozy inside and eat warm spicy curries while lazily watching reruns of F.R.I.E.N.D.S. And this Misal Pav totally fits the bill. 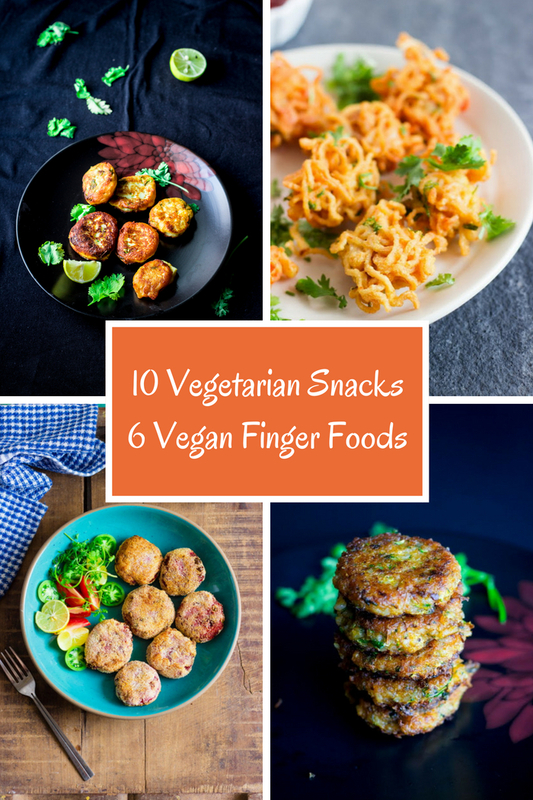 It is spicy, hearty and best of all, you can top it up with awesome crunchy things. When I think of Misal Pav, it takes me back to my college days. Thursday night dinner in hostel was Misal Pav and it was actually horrible. If one were to eat that Misal Pav, one would never ever dare to eat one again. I don't know how the cooks in the hostel mess could mess up something so simple, but they managed to put up an unappetizing dish in the name of Misal Pav. It was only when I ate Misal Pav in a Maharashtrian restaurant that I came to appreciate the flavor and texture of this spicy vegan affair. 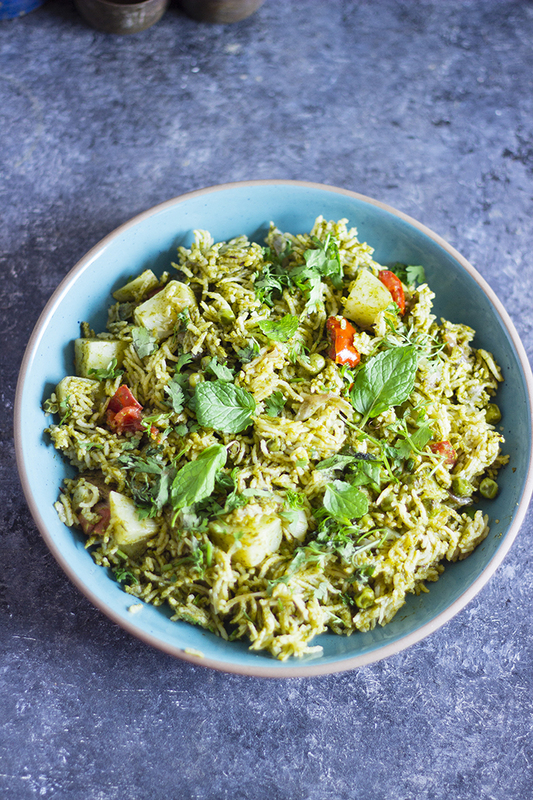 Usal - Usal is a quick curry made from sprouts. 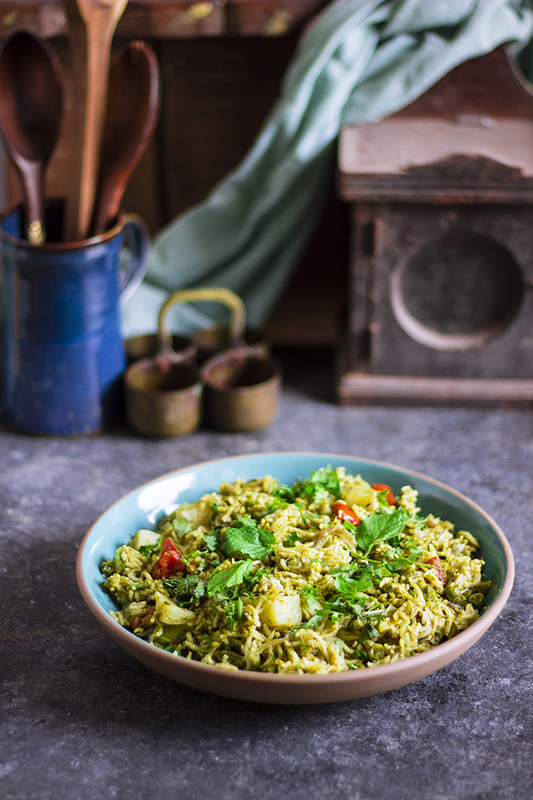 Sprouts are boiled with turmeric, salt and a little bit of asafoetida. You can add other spices to usal when you want to have it plain, but when you are cooking usal for Misal Pav, it is best to keep it simple. 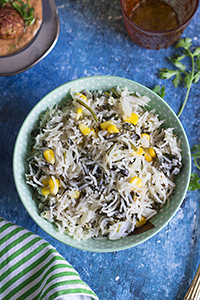 Generally, moth bean sprouts or matki sprouts are used for Misal Pav, but if you don't have moth beans, just use mung beans or any other sprouts that you can. 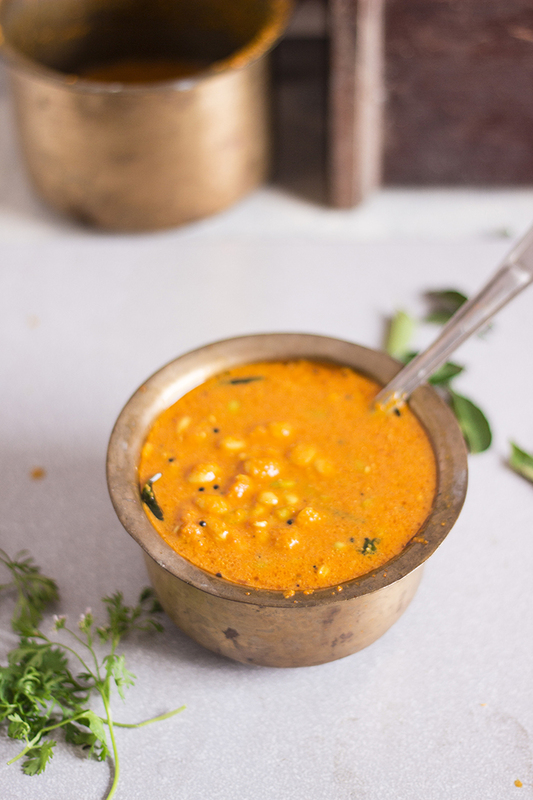 Kat - The spicy coconut based curry that dominates the flavor of Misal Pav is called the Kat. 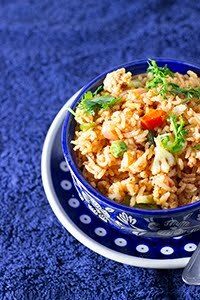 Kat is made by grinding together spices, coconut, onion and tomatoes and boiling them until the flavor develops. I have used Kokum as the souring agent in the Kat, you can use tamarind pulp instead. Kokum helps in giving a darker color to the Kat, that you may miss if you use tamarind. If you have access to Misal masala powder, then you can use that instead of the whole spices I have used. 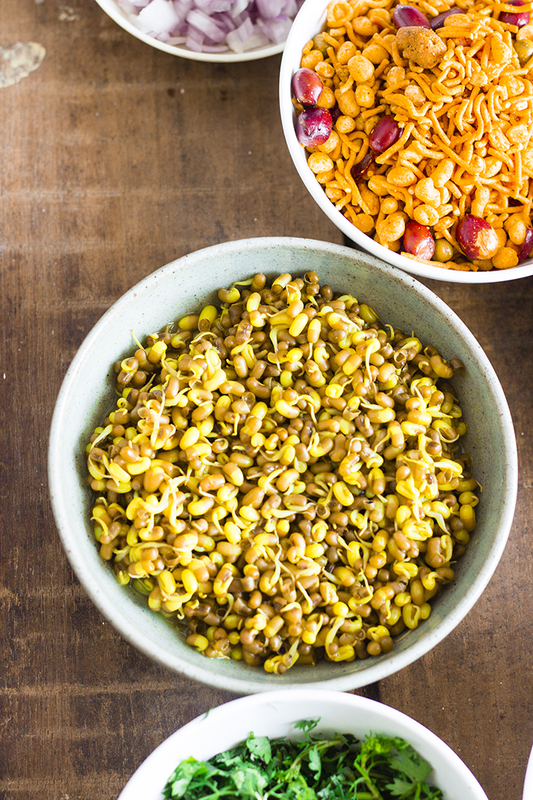 Sev/Mixture/Farsan - This is the fun part of Misal Pav. Misal is always topped with crunchy spicy mixture. You can use any topping of your choice - papdi, ghatia, sev, chiwda etc. The more you add, the better it tastes. Only thing to remember is to add this at the end, while serving, else your mixture will get soggy and loose its texture and flavor. 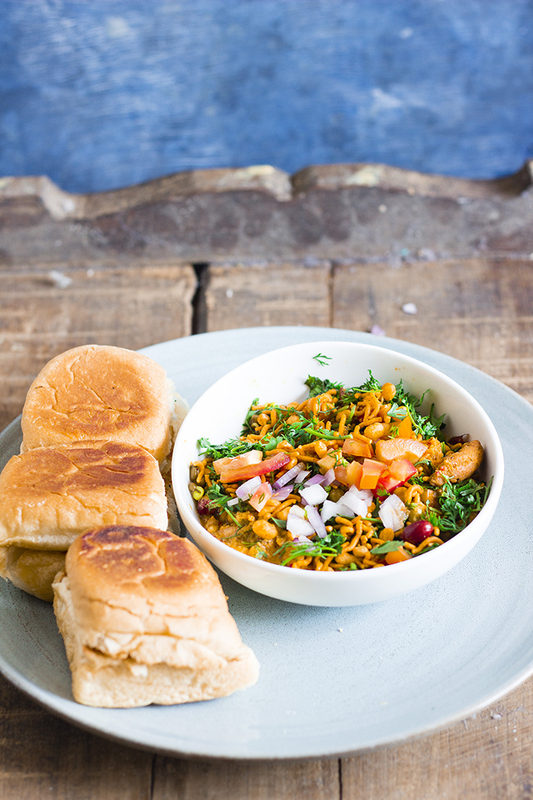 Serve Misal with toasted Pav or regular bread. And always serve it piping hot!! Misal is a popular spicy vegan Maharashtrian curry that is served with Pav bread. 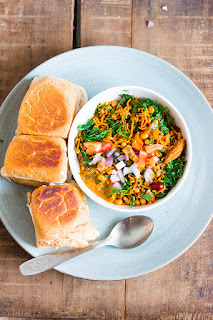 Misal is made with sprouts and coconut and is topped with Sev or Mixture. 2. After the mustard seeds splutter, add the sprouts, turmeric powder, salt, asafoetida (hing) and 1 cup water. Cover and cook until the sprouts are cooked. 3. Grind the clove, cinnamon, pepper, ginger, garlic, coriander powder and cumin powder into a coarse masala without any water. 4. Soak the kokum peels in 0.5 cup warm water and keep aside. 5. 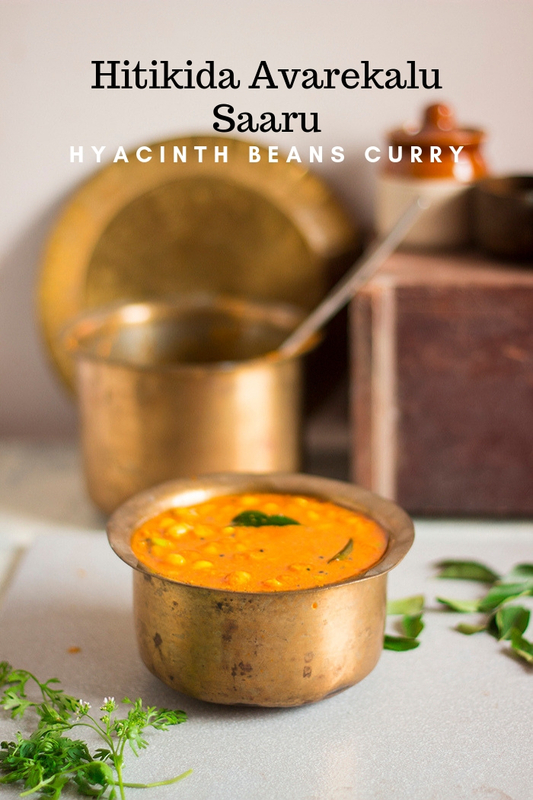 Heat oil in a pan and add the coarsely ground masala. 6. Saute the masala until fragrant, then add chopped onion. 7. 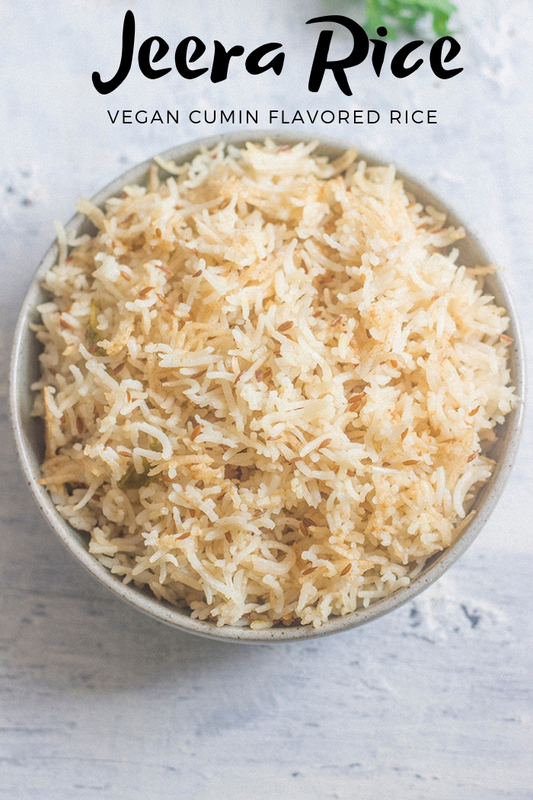 Once the onions are slightly browned, add in chopped tomato and grated coconut. 8. Fry for 2-3 minutes, then grind everything to a smooth paste with a little water. 9. Pour back the masala into the pan. 10. Add in turmeric powder, red chilli powder, salt, soaked kokum peels or tamarind pulp and 1 cup water. You can remove the kokum peels after a while if the gravy has reached the sourness you desire. 11. Allow it to come to a boil and let it boil for 8-10 minutes. 12. Adjust seasoning if required. Add more water for a looser consistency. If you want a thicker consistency, boil it longer. 13. 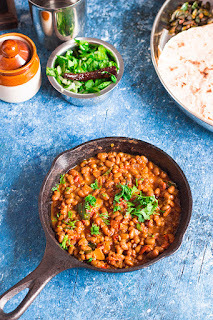 To serve the Misal Pav, add the usal in a bowl. 14. Pour over the spicy kat. 15. 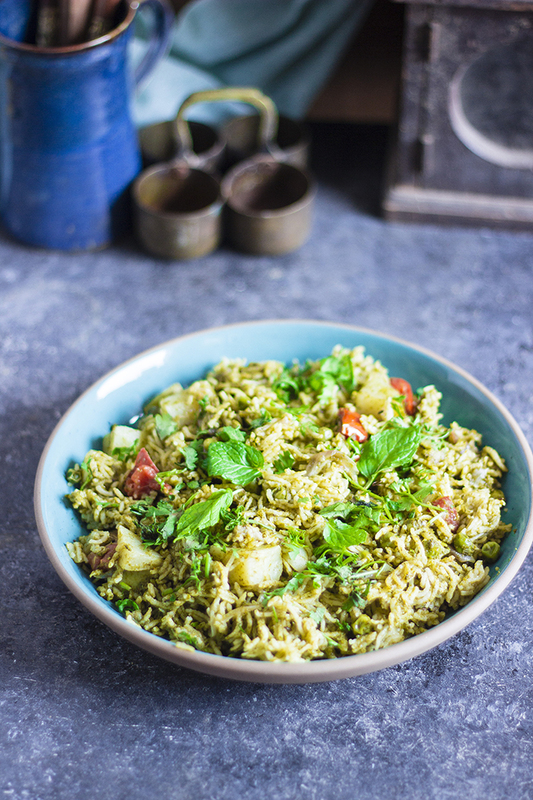 Top with finely chopped onion, tomatoes and coriander leaves. 16. 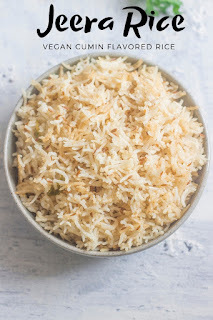 Top with sev or mixture and serve with toasted pav. 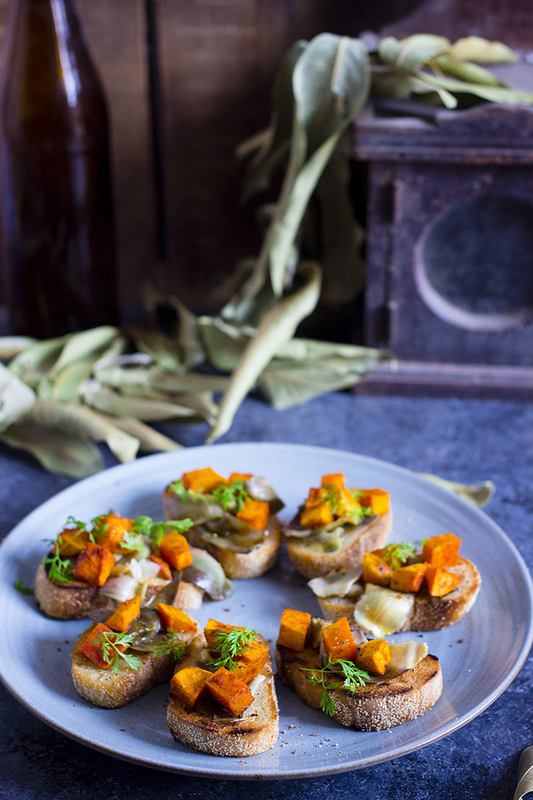 Roasted Butternut Squash and Artichoke Bruschetta. 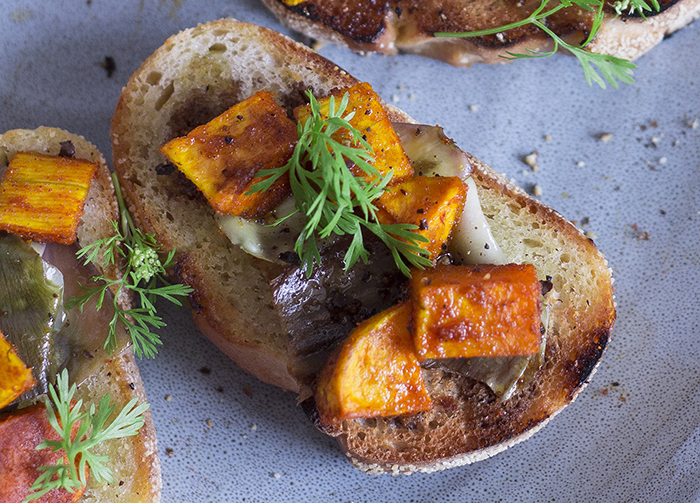 Crusty grilled bread topped with sweet cumin roasted butternut squash, artichokes cooked in the oven until soft, olive oil, and balsamic vinegar. 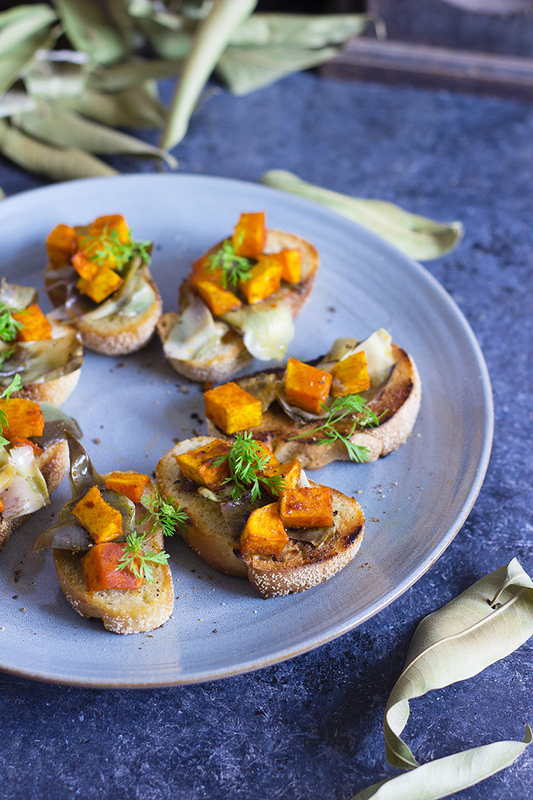 This vegan appetizer is perfect for soirees and parties. Included is a video that shows how to roast butternut squash and how to cut and prepare artichokes to cook in the oven. Hey, we are mid week already!! If you are an optimist (which I am sure you are), you are thinking you are halfway through to the weekend. So true!! Shouldn't we celebrate? 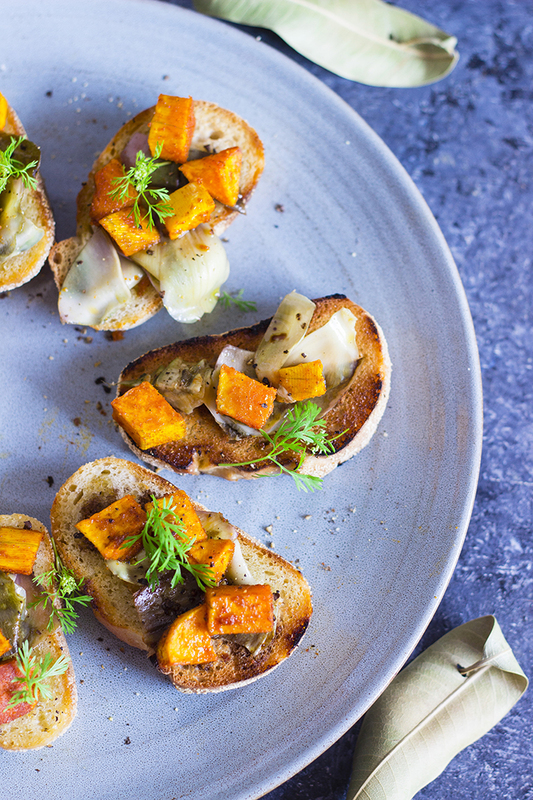 I say we should with this Roasted Butternut Squash and Artichoke Bruschetta. I simply LOVE Butternut Squash. It's a beautiful vegetable. 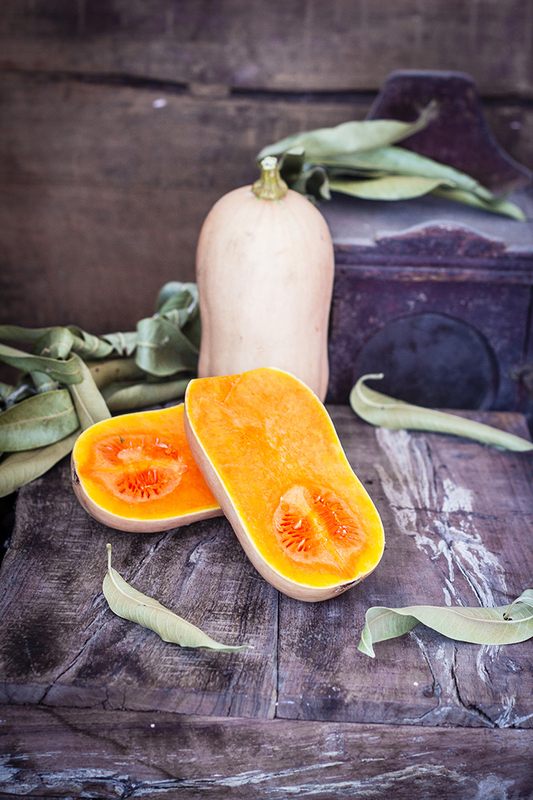 For those who haven't had one, it is the closest in taste to red or orange pumpkin, but slightly firmer in texture. You can replace butternut squash with pumpkin too. But I love the texture of a butternut squash. And roasting it brings out the sweetness of the squash. I kept the flavor profile very simple, just red chilli and cumin. The red chilli brought a nice heat to the otherwise sweet squash and the cumin added a little earthy flavor that worked wonderfully with the sweet squash. The little cubes are so tasty, you won't stop eating them while cooking, so make a little more than you would like to serve. Your own secret stash. Next in, the Artichokes. This is not something very regularly available in India. I happened to find it stocked in the supermarket near my house and I couldn't resist buying it. Good decision, though. The last time I had cooked artichokes, Raj was totally unimpressed. He almost forbade me to buy them this time. But after this time, I may have at least converted him to tolerating them. I almost steamed the artichokes in the oven and they turned out all soft and melt in your mouth texture, that was really appetizing. I absolutely loved them with just salt and olive oil. Gee preferred adding in some Italian seasoning. Season the artichokes according to your taste. 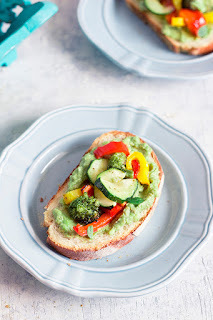 Good quality crusty bread works best for a Bruschetta, but you can use what you have. You can even use crackers. 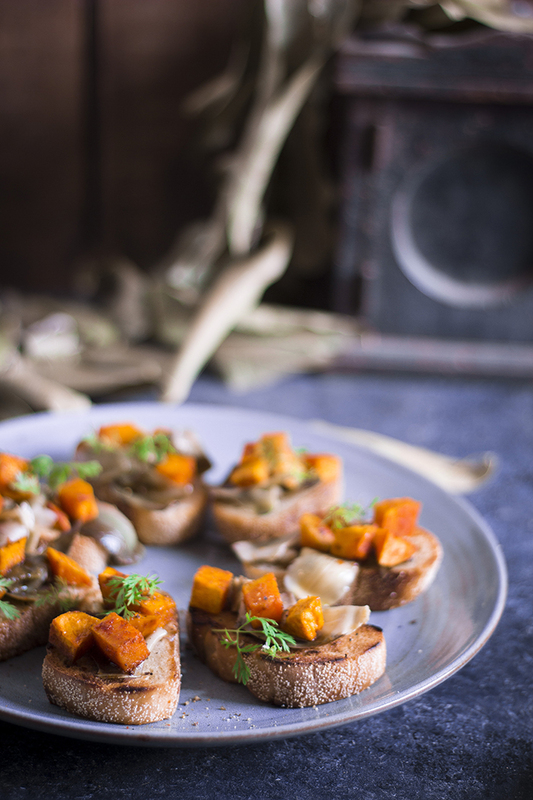 This Roasted Butternut Squash and Artichoke Bruschetta is a perfect snack or appetizer that you can serve for a Sunday Brunch, or Friday night Cocktails, or a just a soiree with friends. It is also something that you can prepare in advance, so you can leave your hair loose and enjoy with your family and friends and just accept the compliments that will come your way. Happy celebrating! 1. Peel the butternut squash and remove the seeds. Dice it into bite sized pieces of about 1 cm. 2. Add salt, red chilli powder, cumin powder and 2-3 Tbsp of olive oil and mix well. 3. Layer them on a baking sheet and bake for 20 minutes at 220 degree Celsius or until soft. 4. In the meanwhile, prepare the artichokes. In a large bowl, take water and add lime juice to it and keep close by. 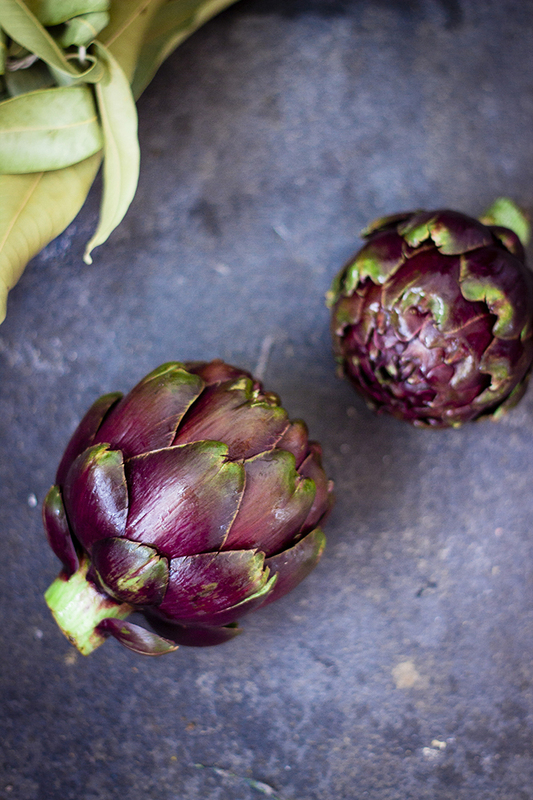 Acidulated water prevents artichokes from browning. 5. Cut the top of the artichoke and remove the tough outer leaves. Keep dipping the artichoke in lime water to avoid browning. 6. Trim the stem and cut the artichoke into half and soak it in the lime water. 7. Once all the artichokes are prepped, place them in a baking pan and drizzle olive oil and salt over them. Use your fingers to rub the salt and oil into the artichokes. 8. Add water to the pan and cover with aluminium foil. 9. Bake for 35-40 minutes or until soft in an oven at 220 degree Celsius. 10. Allow the artichokes to cool a little and either chop them or separate the individual leaves. 11. Slice the baguettes and grill them or toast them until crisp. 12. Top with the artichokes and butternut squash. 13. Drizzle with olive oil and balsamic vinegar. Top with freshly cracked pepper for taste. 14. Serve warm or at room temperature.